1. The tulips are almost done. These are the last, three beauties in a pot on the back deck. I'm convinced the squirrels got a lot of my bulbs because I know I planted more. 2. Peonies are coming! There are lots and lots of buds and I'm so looking forward to all the pink ruffly petals. But...it's only the beginning of May. So early, even for our climate. 3. And can you believe it - tiny green strawberries already forming. I noticed the flowers a week or more ago and again, I'm surprised at how early everything is growing. It makes me wonder what the summer holds. 4. These gorgeous cornflowers (centaurea montana) self seed in my garden and offer blooms throughout the growing season. This plant is in its first bloom and I was struck by the perfect geometry of the bud. 5. My full-time teaching stint ends tomorrow (Friday - I'm posting Thursday night). I've had to work to get my head around it. Part of me (the larger part) was hoping the teacher would decide to take the remainder of the year off and I could finish. I've grown attached to these students and will miss them. The other part of me (that I'm cultivating in my mind) is looking forward to spending some time with the little ones, gardening (the weeds are taking over), sewing and a host of other activities that have been set aside for the past three months. I'll still be at the school from time to time. AP exams are happening over the next two weeks, and I'll be invigilating again. The weekend approaches. We'll be taking a trip to the mainland and I'll tell you about it next week. Have a wonderful weekend! This lilac bush has traveled far. My parents gave it to us 13 years ago when we returned to Canada. It was a small volunteer plant in their neighbourhood in the Okanagan. We brought it over the mountains and the ocean to our island. Several times the plant found itself dug up and transplanted as we tried to figure out what to do with our yard. From the front to the back where it languished too close to the cedar hedge. More digging two years ago and now it flourishes in a sunny spot. We're hoping it continues to grow to provide shade for our patio. More blooms inside, their beauty doubled by the mirror. I sit on the couch and have only to lift my eyes to admire them. Their scent is never overwhelming - a mere hint wafts about the room unless one stands sniffs closely. We planted two more lilac bushes this weekend - volunteers collected along a pathway. Soon a mower will be chopping the remaining volunteers down, so we feel a little like we've saved these ones. They are small, but they will grow. When lilacs bloom is a lovely time. 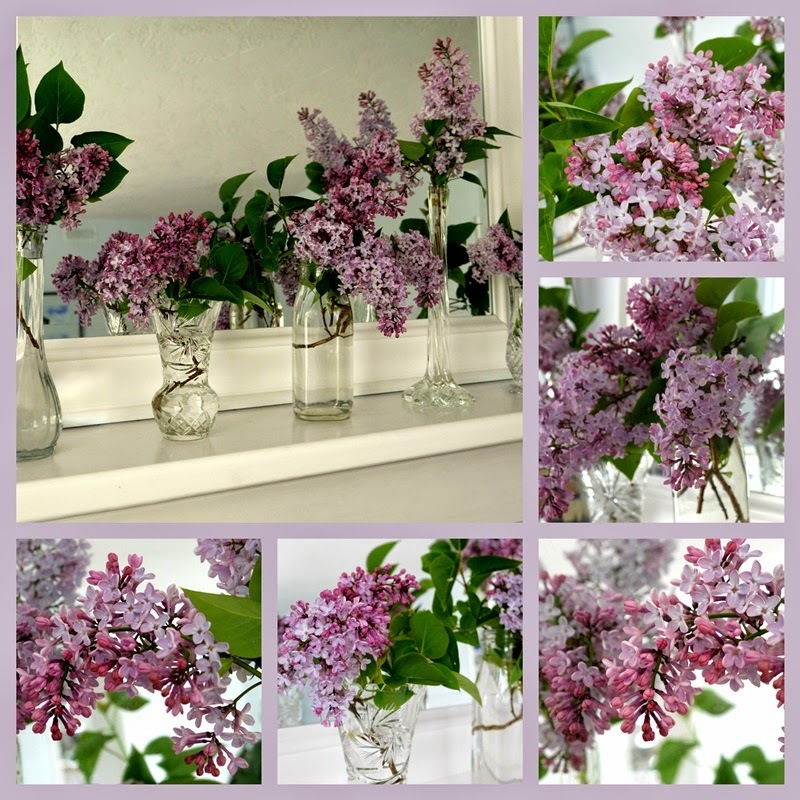 To borrow and adapt from Anne of Green Gables - "I'm so glad I live in a world where there are lilacs." I'll be linking up to Mosaic Monday, hosted by Judith of Lavender Cottage. 1. I'm so glad tomorrow is Friday (I'm posting this Thursday night). It's been a long week. Report cards are done, classes went reasonably well although students are beginning to get squirrelly. 2. A few photos from last weekend's boating trip. Youngest daughter with her niece (Miss S) and yours truly above, setting out on a beautiful morning. 3. I still have so much to learn about the camera I bought last September (I can hardly call it my new camera anymore). But I was pleased with the diffusion behind the delicate branches in the above photo. 3.5 (I'm cheating a little.) The view through the trees on Portland Island. The beauty is almost overwhelming. Some days it feels as though my heart will swell out of my chest with emotion. Thanks be to God for such a marvelous world. 4. The small views are no less amazing. Clusters of mussels, tiny curled snails, and barnacles of sundry sorts live in the intertidal zone. 4.5 Aren't these interesting? They look like little nosegays. I looked in a couple of field guides but couldn't find out what the plant is called. Does any reader know? edited to add: Thanks to Materfamilias for identifying the plant as Miner's Lettuce (Claytonia Perfoliata), an edible native plant. Interestingly, it was taken from North America to Europe where it became a "widespread edible weed" according to an article I read on line. Had I known what it was I would have gathered some for our dinner! 5. Just before sitting down to dinner on Saturday night. I had prepared a large quantity of Mexican shredded beef earlier in the week and frozen it. I put it into the slow cooker before heading out on the boat. When we got home we prepared the other ingredients and a salad and dinner was ready. The whole gang came over for that. Isn't the table runner pretty? It was a gift from our visiting friends who have recently moved back to the USA from Ecuador. What's on your schedule this weekend? Our calendar is empty for the first time in a long while. I need to do some cleaning and laundry, but I also hope to do some sewing and gardening. We'll see. Maybe I'll just curl up with a book. Pink and blush tulips in harmony on the mantel, their colours softening with time. The brighter ones were a gift from Miss S's parents for keeping her overnight recently. I've never had or needed a large wardrobe. With this full-time teaching stint I find myself scrambling to come up with new combinations. Black, grey and navy feature strongly. Colour is added with scarves and the occasional cardigan. Last week I took a daily photo before I stepped out the door. 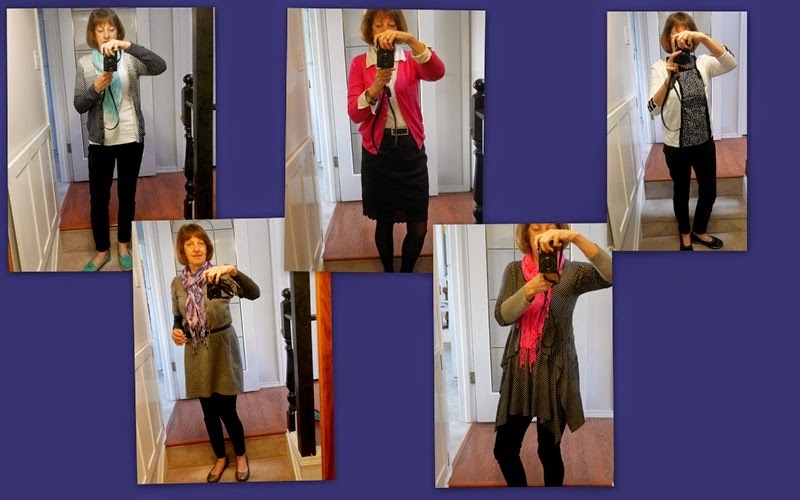 I found it a good exercise in seeing what I wear and how I feel about my style. I think I'll continue for awhile. It's easy to get into a rut and pull on the same things day after day. Something else I did a few weeks ago was to turn all my hangers backwards on the rod. When I wore something I put it back in the closet correctly hung. I'm pleased to see that I wear much of what's hanging there. Just a few things need to be incorporated into my daily wear or taken to the thrift store. Another tulip photo - this one with a 60s vibe thanks to special effects from Picasa. Remember the rounded corners and the yellowish cast? I'm off to another day in the classroom. Report cards are due in the next day or two and my blog visiting time will be minimal. I'll catch up with everyone closer to the end of the week. My husband and I often walk after dinner. In the winter months there isn't much to see, unlike now when the light lingers on and delight lurks around every corner. We walk along our neighbourhood streets then onto paths through green spaces. The distance is somewhere between a kilometre and a mile, we think. 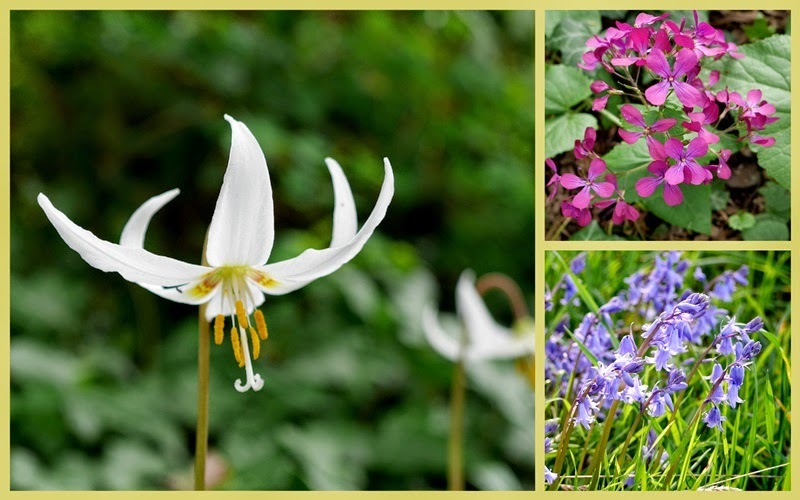 At this time of year fawn lilies bloom, their shy faces pointing downwards. I crouch low and tilt my camera up to capture its delicate structure. Bluebells grow in clusters, always beautiful. I noticed this pink flower recently, but haven't been able to identify it. Do you know what it might be? edited Monday evening: Thanks to Vee and Materfamilias for pointing me in the right direction - Lunaria or Money Plant it is. I now remember seeing the round "coins" in the same woods last fall. Through the woods and onto a quiet street. The tree above is full of white blossoms and one lone branch of pink. Up and around through another wooded trail. I had tucked a plastic bag into my pocket hoping that the lilac bush was blooming. We clipped a few branches and they will grace the mantel for about a week, filling the air with sweetness. Government House is the residence of the Lieutenant Governor of British Columbia - the Queen's representative in our province. The house is open for tours just one Saturday per month, or by special request. But the grounds are open every day (almost) from sunrise to sunset. Last Monday we strolled through the gardens. 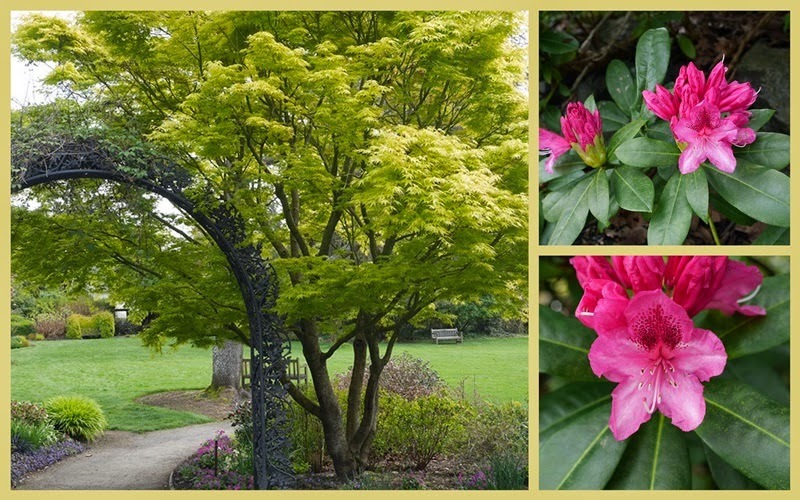 There is much to admire at this time of year - rhododendrons, camas lilies, fawn lilies, daffodils and tulips. What really caught my eye was spring green. It's such a fresh color, new to the world and full of eager brightness and vigor. 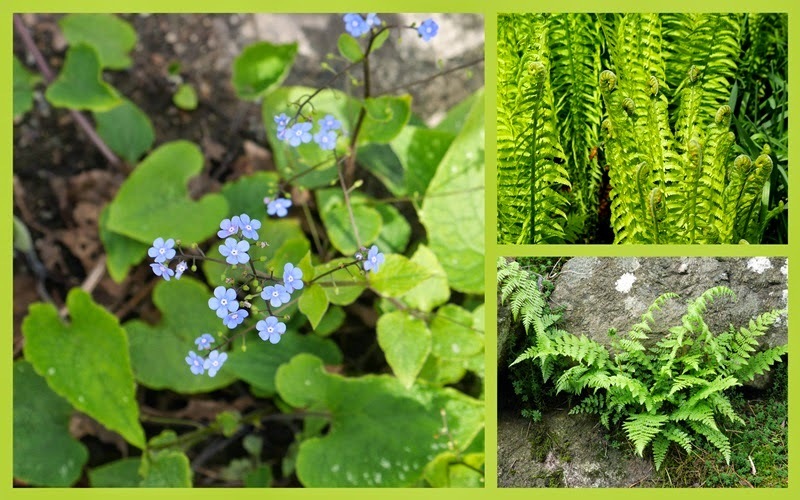 Unfurling ferns and emerging leaves are the perfect foil for spring blossoms. These magnificent tulips caught my eye, too. So rich looking, don't you think? Imagine a small island in a very big sea. Rocky cliffs on the south are carved by waves beating against the shore. Gnarled trees stand as witness to the prevailing winds. A different world exists on the northern exposure. Sheltered by a larger island a mere canoe ride away, the land slopes into gentle bays where shellfish cling to rocks. Ducks and gulls paddle and dive for food. Just steps from the water, a family once lived in a white wooden house with green shutters, and planted an apple orchard and a large strawberry garden. Years passed. The family drifted off the island and the land became a park. The house drowses now in the sunshine, shut up tightly against the winter rains, waiting to open in summer when descendants of the original owners come to stay and provide information for boaters who stop by. I stand in the long green grass and listen to hundreds of bees in the blossoms, busy about their work, unmindful of time and its effects. I think of all the bees that have buzzed over millenia and of the women who have stood, listening, while the warmth of the spring sun caresses hair and head. We hold that in common, those women and I: the desire to be in the moment, to take note of the change of seasons, of the aching beauty of our planet that is so often at odds with the horrors mankind inflicts upon it and upon each other. A chorus line of daisies smiles up at me from the grass, innocent and cheerful regardless of any acknowledgement or scorn. Grape hyacinths stand tall under an apple tree. Who planted them, I wonder? Did a child collect short stems in chubby hands and bring them as a gift to her mother? Clumps of bluebells sway gently. In the cold morning a sleeping bee loses his grip and falls off his perch. He'll sleep until the sun's warmth awakens him and then he'll be about his work. Flowering red currant is a spring time sight, beautiful bits of color among the forest's greens. We talk, we laugh, we explore. The past is very present. Time is suspended as we wander in wonder. 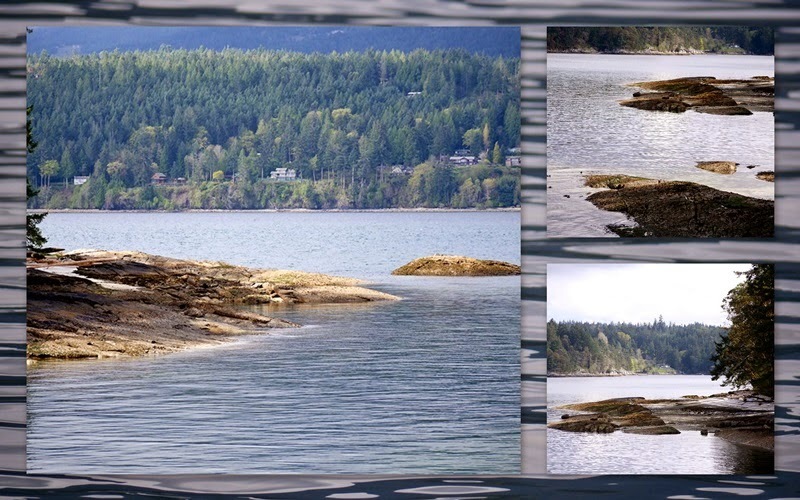 Russell Island is equally as beautiful in the spring as it is in the fall, featured here. Choppy waters and clouds on Saturday morning gave way to sunshine and smooth seas by noon. Russell Island, not too far away, was a great choice for our first boating outing of the season. On the more exposed south-east side of the island, waves rushed against the rocks, white foam subsiding into blue. Out in the channel the beaten metal water reflects light and cloud. In the distance a BC Ferry slips behind an island enroute to Victoria. Driftwood lies on white shell beaches. Its crevices fill with bits of broken shells and stones that change places with every flow and ebb of the tide. Tidal pools are fascinating places, filled with all sorts of sea life and the detritus left behind when clams and mussels are eaten by birds and other creatures. A smaller ferry passes by enroute to Salt Spring Island. Soft focus moss in the foreground covers the rocks. After walking around the island (more photos to come later), we headed back to the boat for lunch, enjoying the lulling motion of the waves and the warm sunshine. A perfect start to spring and summer. Just popping in on Saturday afternoon. We spent the day on the boat with Tim's sister and brother-in-law, and brought Little Miss A along, too. Now we're home and I'm starting to think about Easter dinner tomorrow. Soup's in the crockpot for this evening. I prepared the table center piece yesterday with flowers from around the yard. Can you believe that bluebells are in bloom already? Yesterday the house filled with the scent of citrus flavored yeast dough. Paska is a traditional Easter bread from my childhood. It was delicious! I used Judy's recipe from the Mennonite Girls Can Cook blog. Time to head back into the kitchen. Wishing you all a most blessed Easter. When I saw Ikat Bag's sweet bunny tutorial on Sew Mama Sew last year, I pinned it immediately, knowing I wanted to make a few for the little people I love. I managed to complete the bunnies themselves, 7 of them, during spring break. Cute, cute, cute. Bunnies do get tired, though, and last night (when I should have been marking papers) I made little sleeping bags for the bunnies. Even cuter! Why 7 bunnies you might ask? I thought that it would be more fun for the little girls to have a pair of bunnies - so the bunnies could go hopping around together. Added play value. For the little Mister F I made just one bunny since he's not into the concept of friends yet. And then there were two leftover - for Nana! I'll keep them here for play time when the grands visit. "Hey, Nana," say the bunnies. "When we wake up from our naps, we get hungry!" Tonight's plan is to make carrots in little bags, and possibly skirts for the girls' bunnies. Nothing like the last minute for productivity!